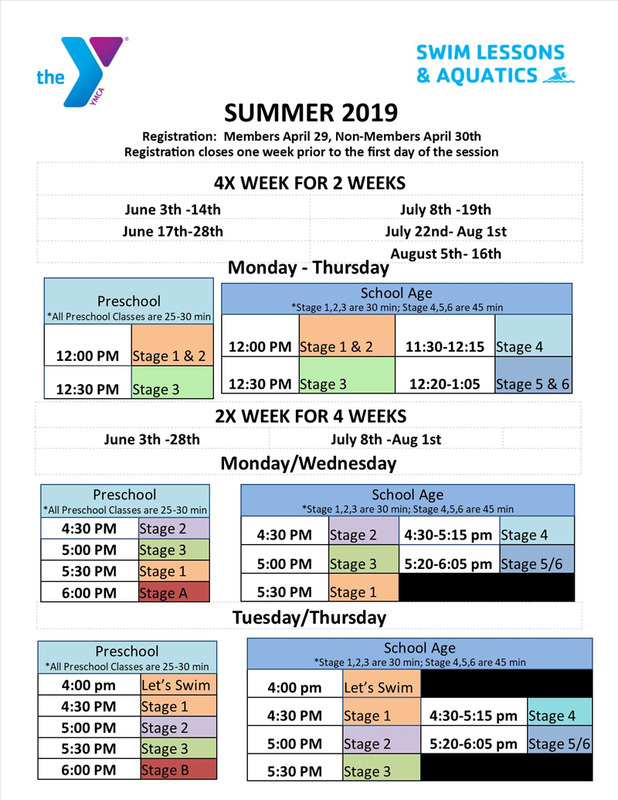 START THINKING ABOUT SUMMER LESSONS!! REGISTRATION opens April 29th for members, 30th for non-members!!! Join dedicated swim instructors specializing in swim skills and safety for this calm and quiet session designed for children with Autism and sensory related disorders. LET'S SWIM!!! The Pool area will not be open to the general public. Cost to the lessons are $42 for members, $75 for non-members. Limited Space Available. Contact Kate Brovold for financial assistance. Adaptive Open Swims are designed for individuals with special needs and their families. Boys and girls age 5 to 18 with autism and/or sensory related disorders are invited to participate in this free event that promotes swimming and water safety. Children of all swimming abilities are welcome. The Kerr Pool area will not be open to the general public. Parent(s) or caregiver participation is required. For class times click HERE and search "Swim Lessons". Swim Starters: Accompanied by a parent, infants and toddlers learn to be comfortable in the water and develop swim readiness skills through fun and confidence-building experiences, while parents learn about water safety, drowning prevention, and the importance of supervision. Level A Water Discovery: Parents accompany children in stage A, which introduces infants and toddlers to the aquatic environment through exploration and encourages them to enjoy themselves while learning about the water. Level B Water Exploration: In stage B, parents work with their children to explore body positions, floating, blowing bubbles, and fundamental safety and aquatic skills. Swim Basics: Students learn personal water safety and achieve basic swimming competency by learning two benchmark skills. Level 1 Water Acclimation: (3-5 year old) – Students develop comfort with underwater exploration and learn to safely exit in the event of falling into a body of water in stage 1. This stage lays the foundation that allows for a student's future progress in swimming. Level 2 Water Movement: (4-5 year old) –In stage 2, students focus on body position and control, directional chage, and forward movement in the water while also continuing to practice how to safely exit in the event of falling into a body of water. Level 3 Water Stamina: (4-5 year old) – In stage 3, students learn how to swim to safety from a longer distance than in previous stages in the event of falling into a body of water. This stage also introduces rhythmic breathing and integrated arm and leg action. 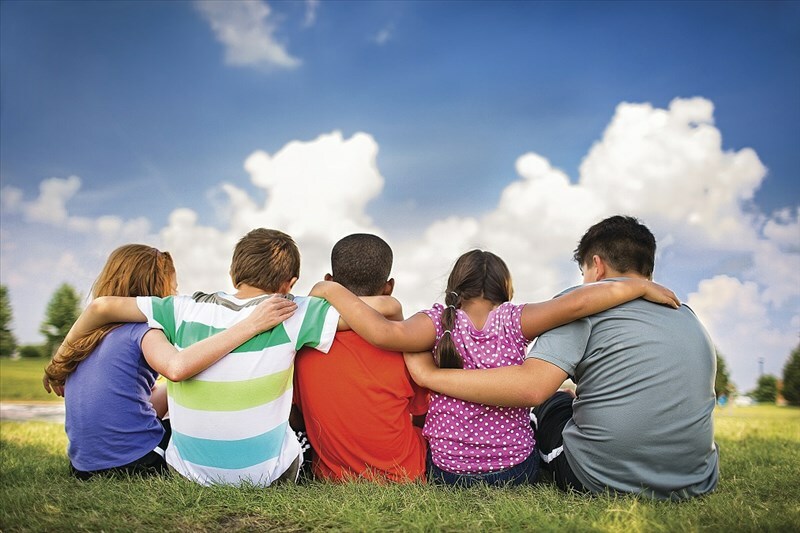 Ages 6 and up *In order for children to advance to the next level and sign up for that level they must pass all requirements for the previous level. Goggles are recommended for all levels! 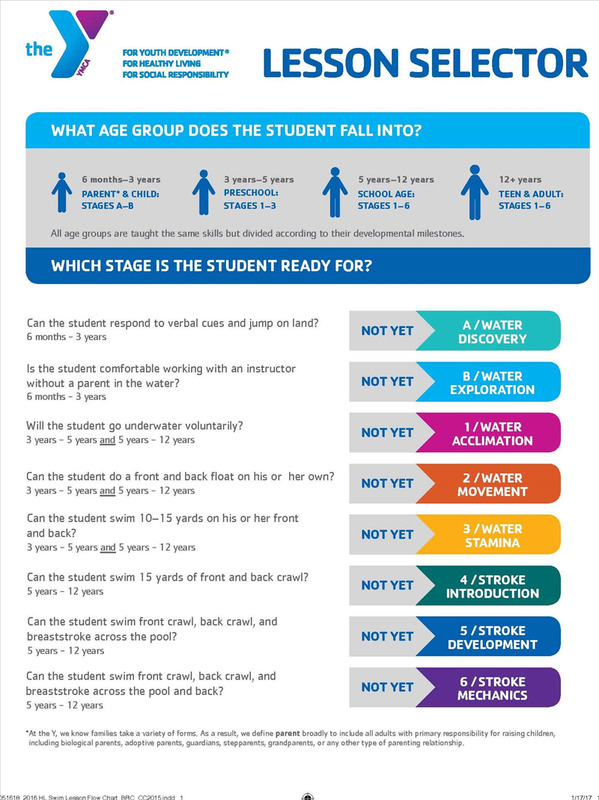 Level 1 Water Acclimation: (Ages 5 and up) – Students develop comfort with underwater exploration and learn to safely exit in the event of falling into a body of water in stage 1. 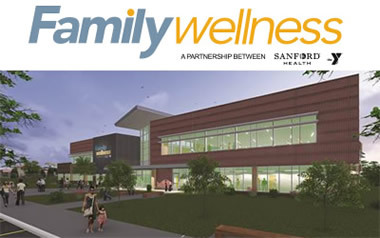 This stage lays the foundation that allows for a student's future progress in swimming. Level 2 Water Movement: (Ages 5 and up) –In stage 2, students focus on body position and control, directional chage, and forward movement in the water while also continuing to practice how to safely exit in the event of falling into a body of water.ack crawl. 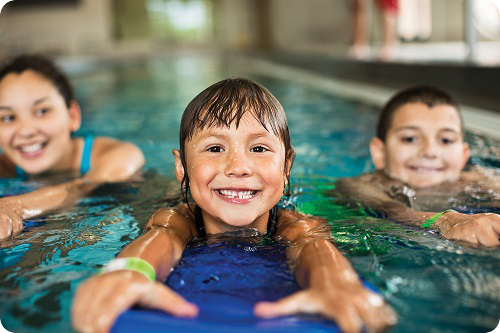 Level 3 Water Stamina: (Ages 5 and up) – In stage 3, students learn how to swim to safety from a longer distance than in previous stages in the event of falling into a body of water. This stage also introduces rhythmic breathing and integrated arm and leg action. Level 4 Stroke Introduction: (Ages 5 and up) – Students in stage 4 develop stroke technique in front crawl and back crawl and learn the breastroke kick and butterfly kick. Water safety is reinforced through treading water and elementary backstroke. 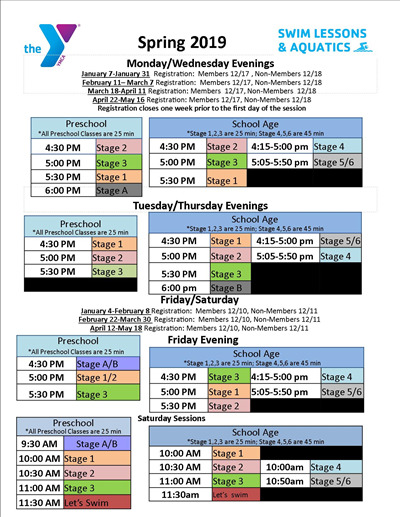 Level 5 Stroke Development: (ages 5 and up) – Students in stage 5 work on stroke technique and learn all major competitive strokes. The emphasis on water safety continues through treading water and sidestroke. Level 6 Stroke Mechanics/Barracuda Club: (ages 5 and up) – In stage 6, students refine stroke technique on all major competitive strokes, learn about competitive swimming, and discover how to incorporate swimming into a healthy lifestyle. Please consider Barracuda Club or a swim team as an option to further lessons. Contact Aquatics for further information at 751-9715. Private swim lessons are a great way for adults and kids to achieve specific goals, catch up to their age group or receive individualized attention on a flexible schedule. Register online or with Membership Services and contact Aquatics to arrange a time. Dual lessons are also available. These are similar to private lessons but allow for two swimmers of similar skill level to learn together. Both participants must purchase a session. Dual Lessons -$60 per participant for 4 lessons for members, $120 for non-members. CARE & CAMP EXPERIENCE EVER!